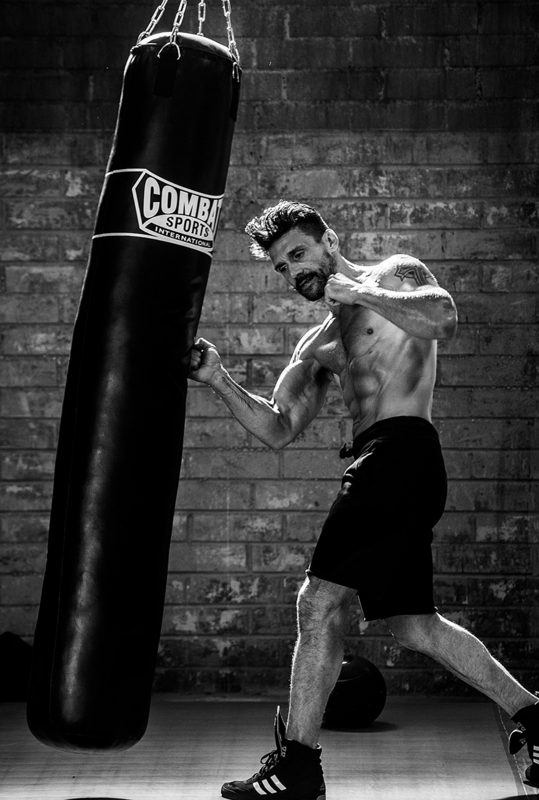 Frank Grillo started boxing at age 18 and was barely out of college when he first walked into Brazilian Jiu Jitsu legend Rickson Gracie’s gym to learn martial arts. In other words, long before he played a fighter turned trainer alongside Tom Hardy in Warrior, or in the drama series Kingdom, Grillo knew what it meant to put long hours in at the gym to get in fighting shape. “I’ve been training for the better part of 35 years, and everything I do comes back to having that fighting grit,” says Grillo over a hearty breakfast of eggs and avocado at New York’s Roxy Hotel. After this conversation he’ll head over to spar at Mendez Boxing, a place that he has considered his second home in the city for years, before he moved with his family to Santa Monica. The fighting gym continues to be a huge part of Grillo’s life, one that kept has him looking nowhere near the 51 years of age he’s about to turn and put him in touch with the likes of Rampage Jackson and Gracie, helping him to shape a seriously convincing role as a fighter and trainer on screen. How do you make your show Kingdom feel as authentic to the MMA sport as you do? Our gym is like a real gym, and we fill it with professional fighters from the UFC and beyond. We have those guys around all the time. So the atmosphere is perfect for it. It’s a huge warehouse we made into a real hangout. Who are the guys who are coming through the set? Greg Jackson, who is a legendary trainer, is a consultant on set. Joe Daddy Stevenson comes by all the time, and so does Lyoto Machida. Rampage Jackson comes through and is a friend of mine. We also have a lot of up-and-coming guys who come and hang out. Rashad Evans came through recently as well. It seems like the MMA crowd has really embraced it. Yes, we’ve been lucky and they’ve given us carte blanche into that world. We can go to any fights we want. It’s the best scenario for me, because I’m such a crazy boxing fan. The California Boxing Commission lets me go ringside all the time. I have an honorary patch. I was just in Danny Garcia’s corner a couple months ago. It was really interesting seeing the coach’s standpoint, because I play a coach on the show. I think a lot of people would be interested to know how little is said about the technical aspects of the fight, and how much it is about keeping their guy focused. Reminding them to breathe and to focus, I would say that was the majority of the communication going between them. How did you start in the ring yourself? I wrestled when I was a kid. That started me off with the discipline, because making weight was my responsibility. It is a team sport but it is also a solo sport. I got into boxing when I was 18. After that I got into Jiu Jitsu in 1990, I met and started trying with Rickson Gracie. I worked with him and also kept boxing. I went around with the Gracie team. Then when I moved to New York I started working with the Machado brothers. What was it like working with MMA Hall of Famer Rickson Gracie? I like to say that Rickson is like Yoda. He’s a combination of Yoda and Bruce Lee. He is so spiritual. I learned everything from him. What did he teach you about fighting? You know, when you spend time with him and those Brazilian fighters, you see that they live with no stresses. None of them have tons of money, but they’re together all the time and they live well. They eat and surf together. What I really learned was the spiritual aspect of fighting. If you don’t have that connection to the spiritual aspect, then you’re just a thug. Only another fighter can really understand what I’m saying when I say that. For a man I think it is a metaphor for everything. You would think that it would be teaching you aggression, but really it teaches you to be humble. Is there anyone else that you look up to especially outside of the fighting world? My friend Liam Neeson has managed to carve out a great place in the industry for himself and is still doing action movies at 64 years old. He’s my hero. I use him as a template. My middle kid, Liam, is named after him. He’s one of the coolest guys in Hollywood. Do you remember the best piece of advice he gave you?